Some of the gardens we will visit in 2019 have strong Arts and Crafts connections or influences. To put them in context a visit has been arranged to the Whitworth Art Gallery, Manchester, for an hour-long visit to the Study Centre with Senior Curator of Textiles and Wallpaper, Dominique Heyse-Moore to see how the Arts and Crafts style influenced interior design. 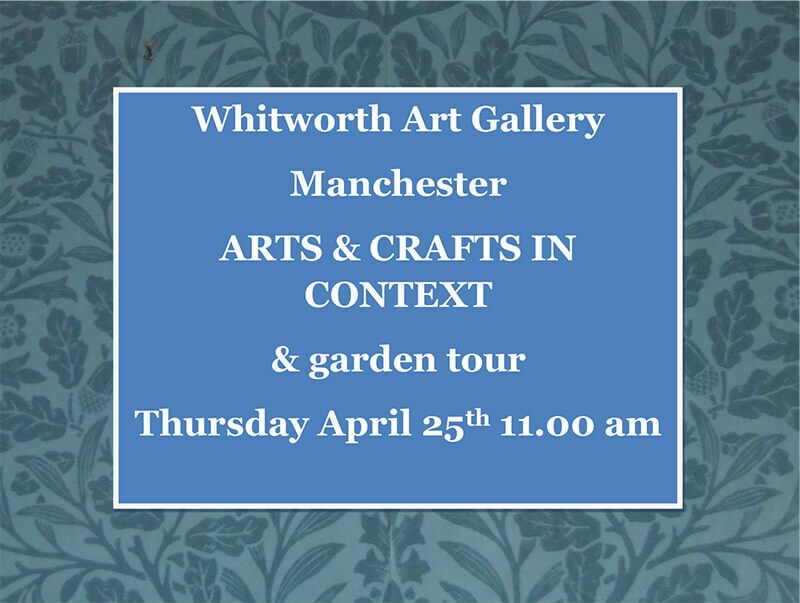 We then go outside with the Whitworth’s Landscape and Sustainability Technician, Patrick Osborn, for a tour of the landscape around the gallery. The maximum number in the group is 20 and places will be reserved on a first come first served basis. If numbers exceed 20 a waiting list will be opened. Guidelines for visits to the Study Centre will be sent to members who book. The gallery is on Oxford Road, M15 6ER but as on street parking near the gallery (situated on Denmark Road) can be difficult, using public transport is strongly recommended. There are frequent buses from outside Oxford Road Railway Station which go past the gallery. Ask for the stop nearest Manchester Royal Infirmary. For full transport details see the gallery web site. Meet at 10.55 in the foyer of the gallery, we will then go to the Parkside entrance on the lower ground floor for access to the Study Centre. The cafe will be open from 9.00am should you arrive early (but access to the café is via the Parkside entrance only prior to 10am). The café will also be open for lunch.